This post was sponsored by my friends at Sprouts Farmer’s Market. As always, all opinions are 100% my own! I’m all about keeping it simple when it comes to side dishes. 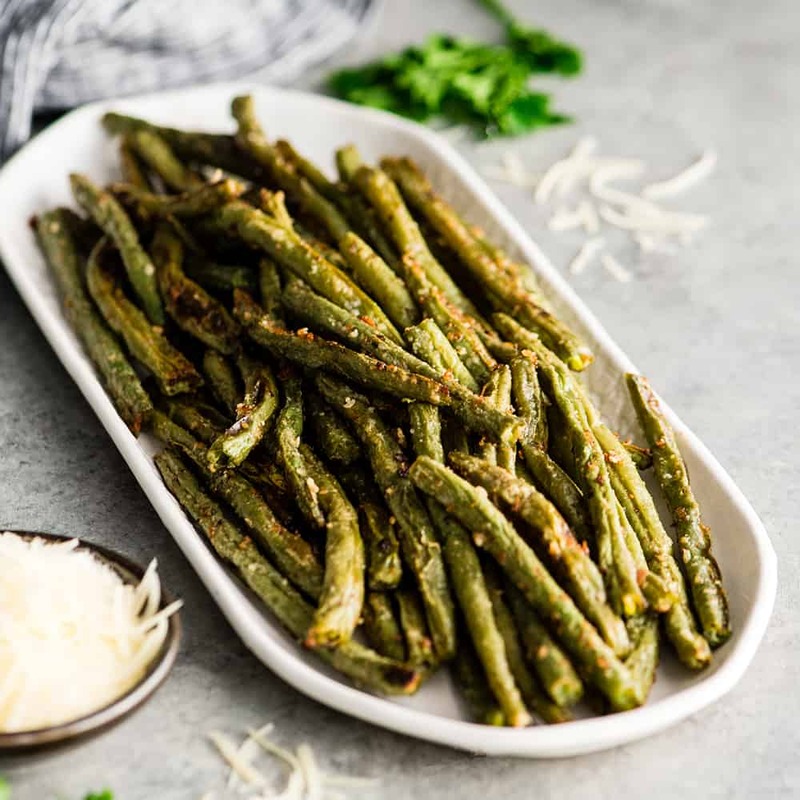 I like to put most of my energy into the main dish and (of course) dessert, so I stick with healthy & easy sides with a handful of ingredients, like these Roasted Parmesan Green Beans. How do you make Roasted Garlic Parmesan Green Beans? Step 1: How do you wash fresh green beans? First, remove the ends from the beans. I prefer to roast green beans without the ends attached because the ends usually become super chewy in the roasting process. Either line up a handful of beans and cut the ends off, or snap the ends off by hand (a great task to have your kids help with)! Place trimmed green beans into a colander. Put the trimmed green beans in a colander as you go! Rinse the green beans. Once you have removed all the ends and the green beans are in the colander, rinse them with cool water. Be sure to toss the beans as you rinse them so they all get washed. Let the fresh green beans dry. I usually do this whole trimming/washing process sometime in the morning, long before I plan on making these roasted parmesan green beans so they have time to dry. If you’re in a hurry you can turn the wet beans out onto a clean kitchen towel or paper towels and pat them dry. 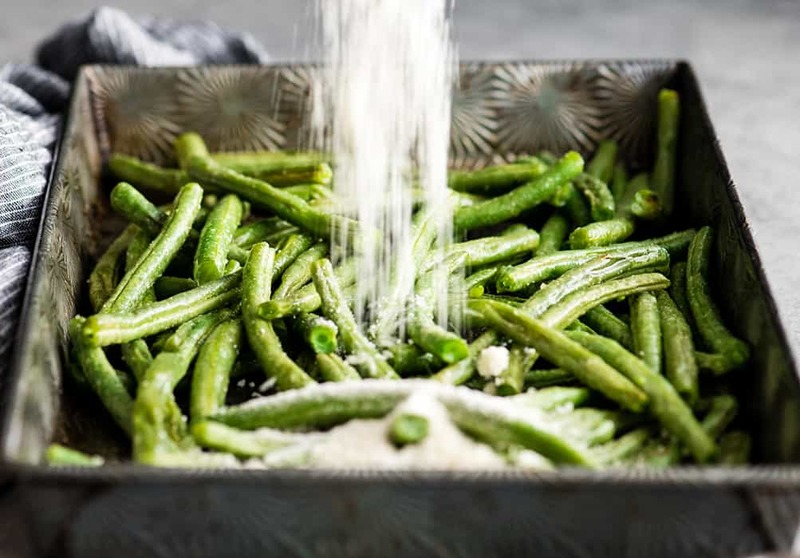 If you’re using frozen green beans to make this Roasted Parmesan Green Beans recipe, simply place the frozen green beans in a colander in the sink a few hours before cooking to thaw to room temperature. As they thaw water will drain from the beans, which is normal. To speed up the process, run the frozen green beans under warm water, then let them dry! Once the green beans are washed and/or thawed and mostly dry, put them in a large bowl and add some (but not all) of the other ingredients. Start by adding everything except for the parmesan cheese. Wait until the second roast to add the parmesan cheese because if it’s added in the beginning, it will burn before the green beans are fully cooked. So, in a large bowl toss the green beans with olive oil, sea salt, garlic powder, and pepper and stir until completely combined. 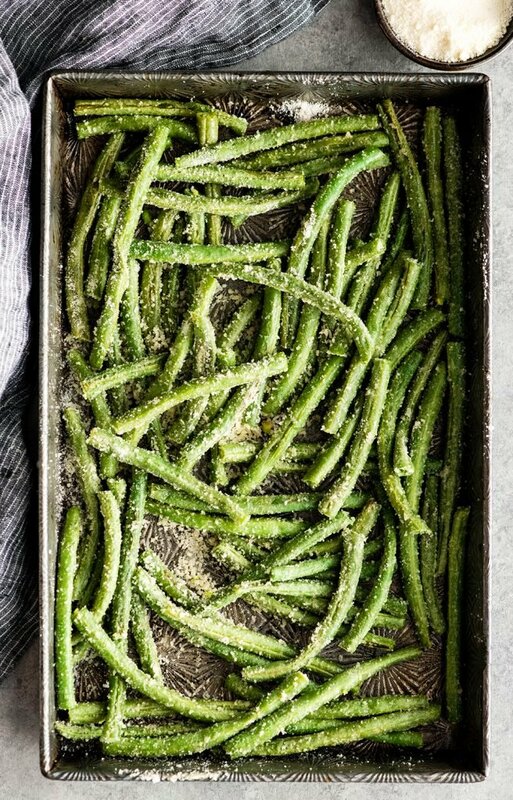 After everything is combined, spread the green beans out in an even layer on a greased baking sheet. It’s important that they do not overlap so that they all brown evenly! Bake the green beans in the preheated oven for 10 minutes. They will turn bright green and will be a little softer to the touch than they were before roasting, but they shouldn’t be browned yet. After 10 minutes, remove the slightly roasted green beans from the oven and add the parmesan cheese. Sprinkle the parmesan cheese all over the green beans and stir them with a spatula to make sure that it is evenly distributed. I recommend using a spatula to use it to lift any oil/cheese that sticks to the pan up off of the pan and onto the green beans. Once the parmesan cheese is evenly distributed, put the beans back in the oven and roast again. Bake the parmesan green beans for about 15-20 minutes more, stirring once halfway through. When you stir the beans, be sure to reincorporate any cheese, oil or spices that made their way to the bottom of the pan back onto the green beans. The green beans are done when the cheese is golden-brown! 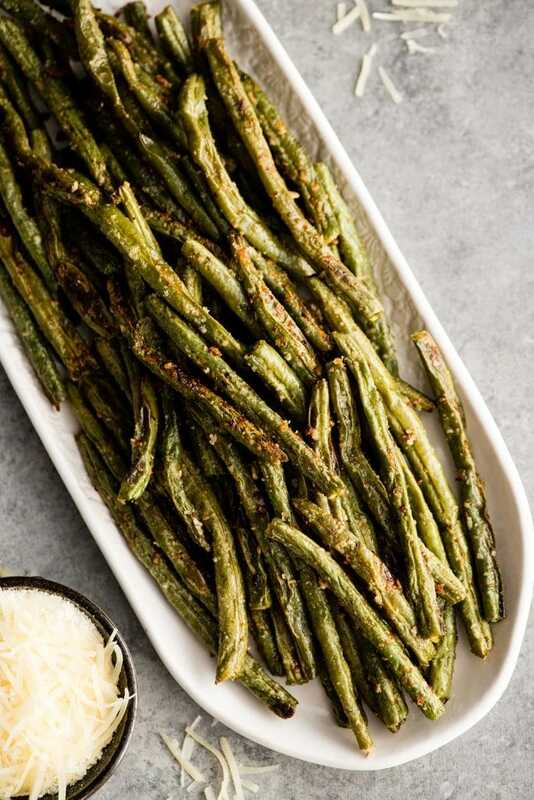 These parmesan roasted green beans are best when they are served immediately, crispy and warm straight from the oven. How do you store roasted green beans? 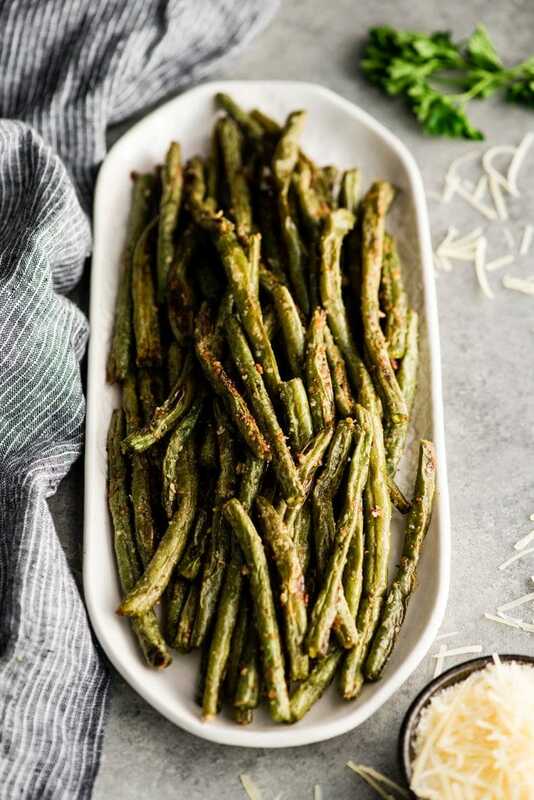 However, we usually have leftovers of these parmesan roasted green beans, and I love to save them to use on salads throughout the week! Store: simply put the parmesan green beans in an airtight container in the refrigerator for up to 5 days! Reheat: These roasted green beans can be reheated in the microwave, however they will lose some of their crispiness after being stored in the refrigerator. To reheat in the oven, warm them at 350 degrees F until they are warmed through. 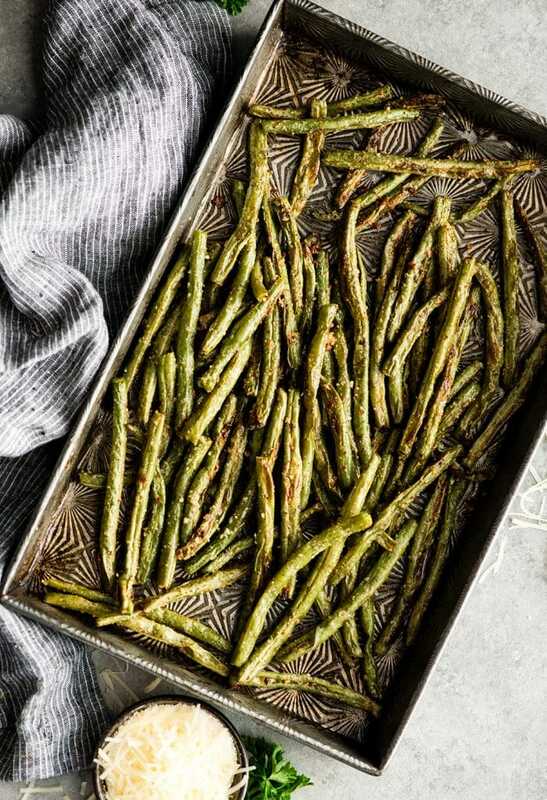 Here are a few FAQs about making this roasted parmesan green beans recipe! Can you roast frozen green beans? Gently grease a large baking sheet. Evenly distribute frozen green beans on baking sheet. Place in preheated oven for 10-15 minutes, or until beans are warmed through and brighter green. Remove warmed beans from the oven and add olive oil & spices. Roast 10 minutes and then add parmesan cheese and continue with the recipe as directed. How do you make crispy green beans? The best way to make these parmesan crispy green beans is to be sure not to omit the pre-roasted step before adding the parmesan cheese. Also baking the green beans at a higher temperature (425 degrees F) helps them crisp up very nicely! 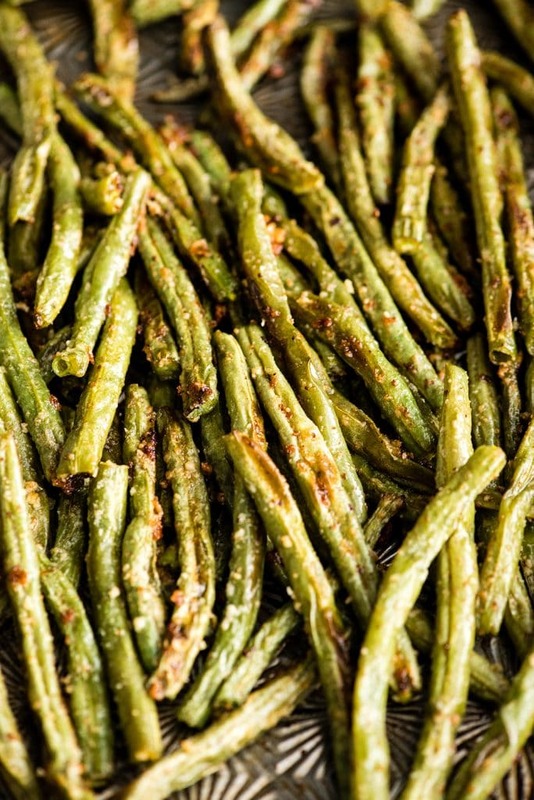 These parmesan green beans are nice and crispy, but still soft and easy to eat! What is the difference between a green bean and a string bean? These two terms, green beans and string beans, are synonyms for the same produce item! When someone says,”Green beans they are usually referring to the most common variety, is called Blue Lake Green Beans. Blue Lakes are the classic green bean and are also referred to as string beans. There is a type of green bean called Haricot vert, which is also known as French beans. These beans are a thinner, shorter and shorter than Blue Lake beans, which means they are more tender and take less time to cook. French beans are commonly sold frozen. What spices go well with green beans? Italian seasoning blend (or individual seasonings like dried basil and oregano). How do you make flavorful green beans? 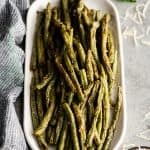 I think these Parmesan roasted green beans are SO flavorful and delicious, I’d recommend using this recipe to make the most flavorful green beans! You can also add the above spices for more flavor, and bacon is always a good choice! 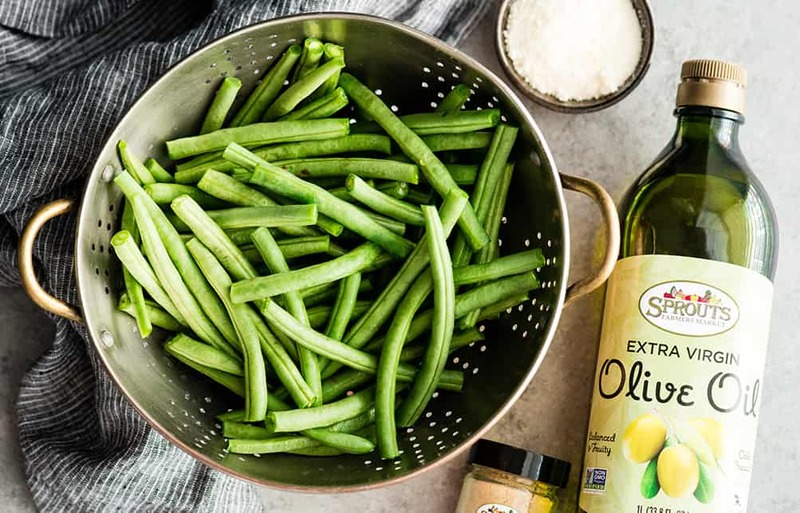 This should come as no surprise to you, but I bought all the ingredients for this roasted parmesan green beans recipe at Sprouts! It is even featured in their November Deals of the Month catalog, that you can pick up in stores or view online here! There are only 6 ingredients in this roasted green bean recipe, so let’s chat about them and possible substitutions! Fresh Green Beans. As I’ve mentioned throughout this post, you absolutely can use frozen green beans instead of fresh, just follow one of the two methods I laid out in the post (thawing or roasting from frozen)! You can use regular or french green beans! I do NOT recommend using canned green beans in this recipe! Olive Oil. Any neutral oil tastes great in this recipe. My recommendations are olive oil or avocado oil! Freshly Ground Black Pepper. Please I beg you to only cook with freshly ground black pepper! The taste can’t be beat and it is easy to find in stores and to use ! Parmesan Cheese. I recommend using a finely grated parmesan cheese (powder-like) in this roasted green beans recipe. It coats the beans so nicely and browns really well. You can add a sprinkle of the larger shreds for presentation if you like! Toss green beans with olive oil and stir until evenly coated. Add sea salt, garlic powder and black pepper and stir until combined and evenly distributed. 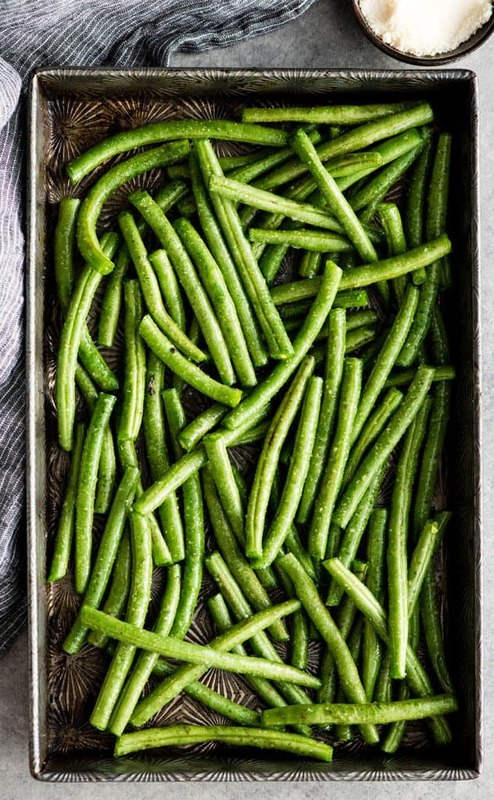 Place green beans on a large baking sheet and bake in preheated oven for 10 minutes. Sprinkle partially baked green beans with parmesan cheese and stir until evenly distributed. Return to oven and bake for an additional 15-20 minutes until the cheese is golden brown, stirring once half way through. I love how green beans can become such a yummy side dish especially with the right toppings like parmesan cheese. do you think the haricot vert type of bean would work? 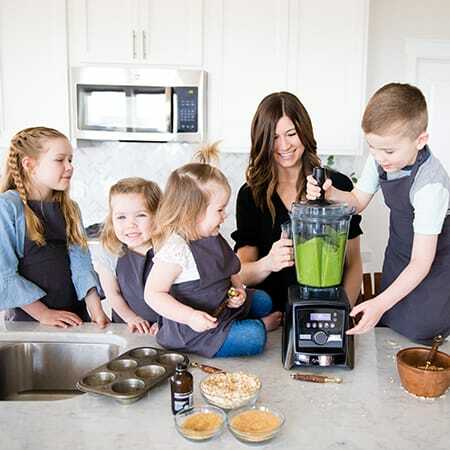 less cooking time? They would work great! And yes I’d watch them because they may cook faster! So glad you enjoyed them Brittany! Hey Karen…honestly these beans are best when they are served right after roasting. If they are left too long sometimes they loose their crispiness and get soggy!